A car stereo amplifier circuit using TDA2040 is shown here. TDA2040 is a monolithic integrated audio amplifier that operates in Class AB mode. The IC has built in circuitry for short circuit protection and thermal shut down and more over it can be operated from a single supply too. The amplifier can deliver 12 watts into to a 8 ohm speaker. In the circuit the IC is wired in order to operate from the cars 12V line. Capacitor C7 is the input DC decoupling capacitor and R4 provides feedback. Network consisting of resistor R5 and capacitor C5 provides high frequency stability and prevents any chance of oscillation. Capacitor C6 couples the ICs output to the speaker. C2 and C1 are power supply filters. Quality of the PCB is a very crucial factor in the amplifiers performance. The amplifier can be operated from cars 12V line. Heat sink is necessary for TDA2040. All electrolytic capacitors must be rated 15V. Only one channel is shown here. For stereo application you must make one more identical copy. This is an interesting circuit. Thank you for sharing this. Hi. In my country i can only find the capacitors rated 50v and above. Is it gonna work with them instead of 15v? I have constructed an Audio Amp Circuit using TDA2003 and TDA2030A, I want to know how much Amperes is required for Both the ICs to produce Full output i.e., 10Watts(TDA2003) and 18Watts(TDA2030A) ? Also Do they require Maximum operating Voltages to Output Full Power as on Datasheets? How to get Full(Maximum) output from This Circuit when operating on Mains Transformer ? How much Current in Amps will be needed to get Full 20 Watts? please tell me which amplifier is best “tda2003” or “tda2040” for 6 inch speaker. Im living in Croatia and we dont have too big choice of parts so with what can I replace c5 (100nf electrolytic capacitor) please ,help me out. good day sir, i’m an engg. student. our teacher given us any amplifier project and when i see this circuit i’m planning to make this one. ahm sir what device to be use to control the volume in this circuit and where i am going to put it?. Can we add a volume control on this? and what value of potentiometer should I use and where should connect it? Am a student, I designed this cct using TDA2030 but the output was very poor. It has humming sound, does not have bass at all,n does nt produce a clear sound. Pls I need ur help before tuesday, it is a project I needed to submit very very soon. 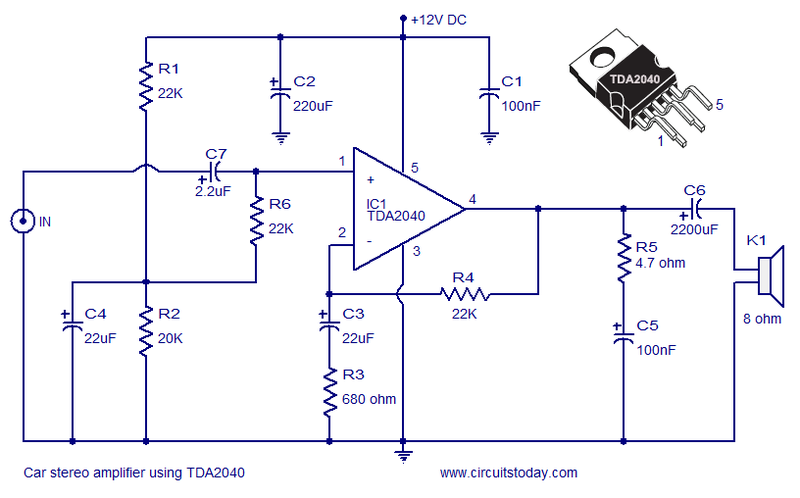 Hi Michael The above circuit with TDA2030 and 12 volt supply will give an output of around 2watts into 8 ohms speaker. The quality should be good. Check C1 and C2 should be as close to the IC pin 3 & 5 as possible. the layout is critical for this amplifier to care of layout problems add 1K ohms resistance between input and C7, add 470PF ceramic disc capacitor in parallel with R6, which will solve your problem. With 4 ohms speaker you will get 4watts output. with 2 X 4 ohms speakers in parallel you will get 8 watts. Thnks for your support and help, I really appreciate it. Doncraze wanted a sub amp and this ckt will make about 35 watts with a 40-45V power supply. C6 should be at least a 35V electrolytic, C2 should be at least 50V, all the other caps should be at least 25 Volts. You can also use TDA2050 or 2052; they handle slightly more voltage and power. Definately use a 8 sq in or larger heatsink. See my earlier note below. He may also want to look up ’40W amplifier using TDA1514′. What if the caps are rated at 16v instead of 15v? I’m planning to build this circuit for a guitar amp. Any considerations I should take into account? Also, I plan to drive this circuit with a preamp circuit (either the ua741 on this site or a JFET one I’ve found). I’d love to have a “master volume” control added to this circuit, in order to give me the option to drive the input harder from the preamp yet keep the overall volume low. Basically creating overdrive distortion. Conversely, I’d like to be able to max the “master” volume and turn back the gain of the preamp to get a cleaner sound. Is there a reasonable way to do this or am I out of my mind? into 4 ohms at 12V supply. C5 can be mylar or disc, C6 can be lower; say 470u or 1000u at 10V, tho any smaller caps can limit bass output. Max Supply V is 18V with TDA2002.